Bob Martindale and Norma Baxter are two government agents tasked with capturing and prosecuting Communists during the McCarthyism period of the 1950s. After years of success bringing down the Reds, their boss promotes them, giving them another target: finding “sexual deviants” within the ranks of the government. Big problem, here: Bob and Norma happen to be gay. Bob married Norma’s partner Millie while Norma wed Bob’s partner Jimmy, settling in a duplex connected by an interior door. To go forward with the task would be betrayal, a lie. A refusal to do so might result in their own doom at the mighty gavel of judgement. “It’s like Hannah Montana, but with homosexuality,” said Alexander Wedge, who portrays Jim Baxter. Wedge shares the stage with Jillian Zuber (Millie Martindale), Conrad Solomon (Bob Martindale), Kerry Sullivan (Norma Baxter), Jackie Chianca (Kitty Sunderson), Kyle Cregg (Theodore Sunderson) and Ziona Bodden (Barbara Brant). 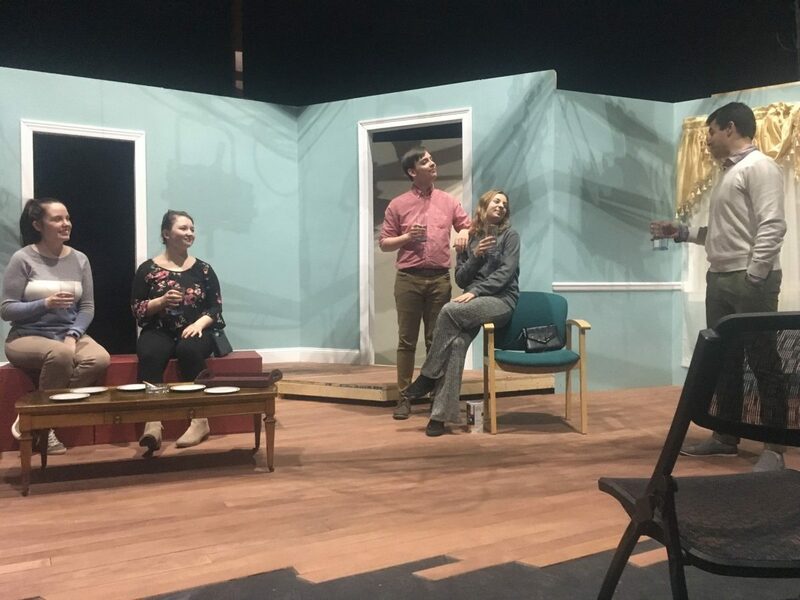 The show is madcap at some points and solemn at others as the main quartet find themselves confronting the truth within both the arrangement they have made and in themselves. Decisions from years past bubble up to the surface and life takes on a sharp edge as the quartet strains to keep their lives mellow. “Lie? It’s what we do. It’s what we all do,” Norma says at one point. Pain hides behind the quick one-liners and overwrought actions. The humor shines brightly underneath the heavy subject matter. The fact that this play, written by Topher Payne, has ties to an actual government operation which took place in the early 1950s brings an interesting perspective to its audience. The quartet’s quarrels feel pointed and relatable to many LGBTQ+ individuals who may have struggled with many of the same circumstances. “As a queer theater artist, I always hope find stories like these, that have been forgotten, or erased, over time. These characters feel so trapped by this arrangement they’ve made, that they’re frustrated with not knowing which of their lives is the real one,” said Wedge. Director Joe Juknievich finds this latest production to be relevant in today’s terms. “It’s definitely a timely piece about visibility and the lengths people are willing to go to be seen,” he said. The play premieres at the Comley-Lane Theatre on Wednesday, April 17 with a showing at 7:30 p.m. “Perfect Arrangement” will run from Wednesday to Saturday, April 20 with performances starting at 7 p.m. Saturday features a second performance running earlier at 2 p.m. Tickets may be purchased at uml.edu/perfectarrangement. Hannah Manning is the Editor in Chief of the UMass Lowell Connector. A native of Haverhill, Mass., she is a senior working towards her bachelor's in English with a concentration in journalism and professional writing. She likes hockey, music and her fellow staff members at the Connector.